Animated content is all over the place and it can be difficult to find the right studio for your job. When you’re spending thousands of dollars on advertising for your business it can feel like a gamble. That is why we are offering our most competitive rates ever on explainer videos. 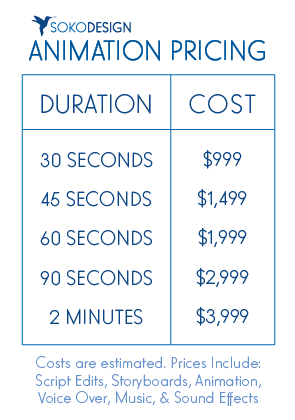 Your average animation on TV costs somewhere around $10,000 per 60 seconds of animation. Our animations are a fraction of the cost without sacrificing quality or customization options for your business. We will work hand in hand with you to craft the highest quality animation for your business. Soko Design can help polish your script to get it focused on animation. We will be fully invested in your explainer video and the whole thing can be done remotely through phone and email consultations. Give us a call or send us an email and we will help you create an amazing ad for your company right away. And you won’t be spending ten grand!